Week 17: Prepping for eggs! Tonight, Loretta squatted for me! 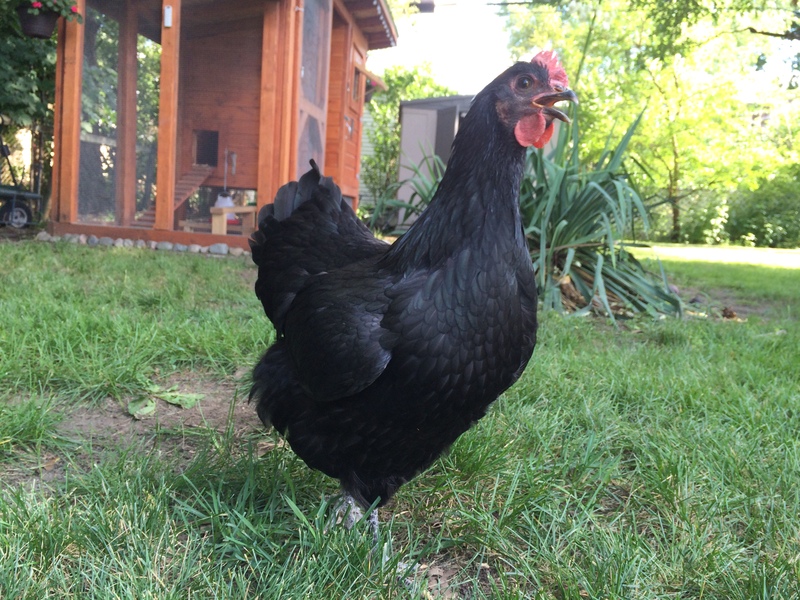 In chicken-speak, this means she’ll be laying eggs in the next week or so. For some reason, she wouldn’t come out of the coop today. Normally she’s the first one barging through the door. But it took coaxing, and finally me just picking her up and putting her outside. That’s when she did it. Loretta, facing away from me, knelt down and slightly outstretched her wings. I had read about this behavior, and immediately recognized it for the good news it is. I welcome any and all good news, especially after I unexpectedly spent three days in the hospital this week. Matt was a real champ, staying by my side in the hospital and still finding time to take care of the chickens while I was laid up. More good news: I have a visitor — my brother Bryan who just arrived from Fort Lauderdale, Florida. It wasn’t long before he was hen pecked. 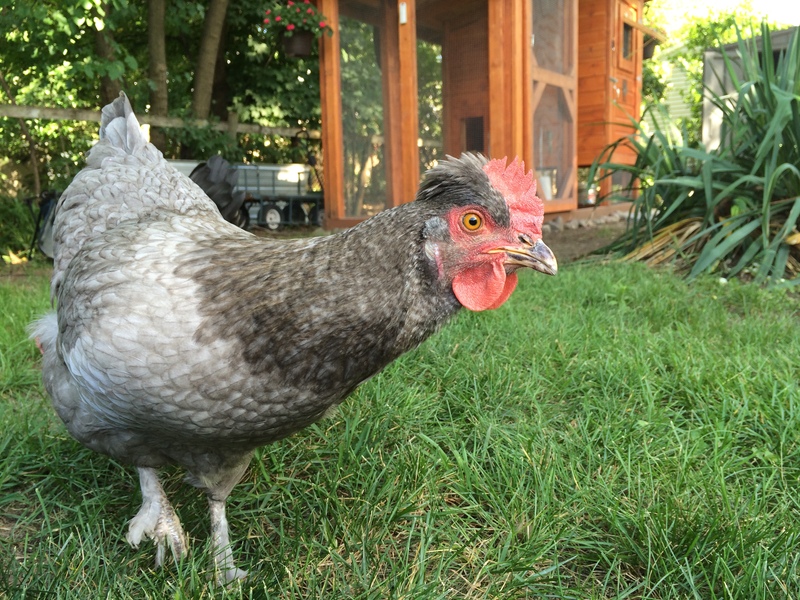 I showed Bryan the girls, and the chicken coop, which was not finished when he last visited in December. Gigi, Loretta and Nellie cooed and called out to him. They wanted out of the coop, so I opened the door. 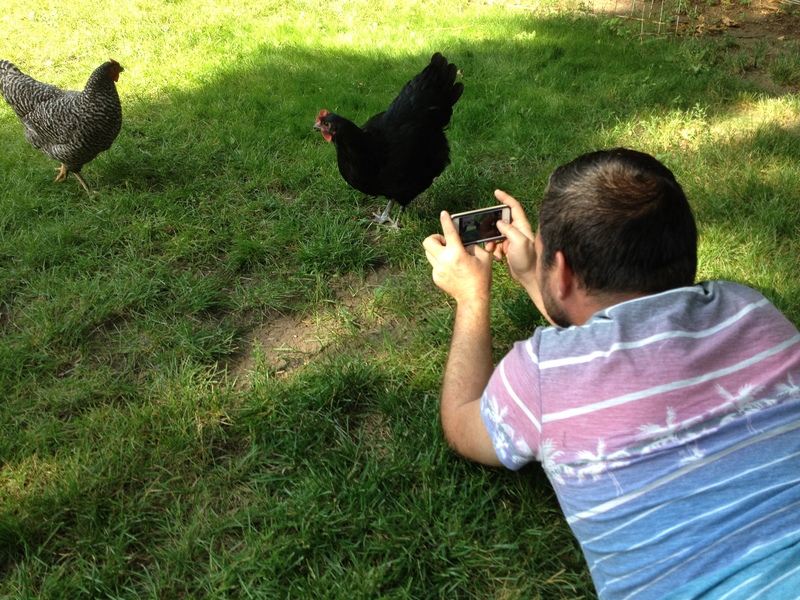 Bryan pulled out his camera, laid down in the grass, and let the girls get up close and personal. Nellie tugged at the strings hanging from his shorts, and Gigi cautiously pecked at him. Loretta eyed his toes before trying to take a bite. My brother, Bryan, snaps a few shots of Loretta and Nellie. None of this fazed Bryan, and he got some great photos of the girls. Tomorrow, I am taking Bryan for his first trip to a Tractor Supply Co. I need to pick up a few things to prepare the nests, since eggs are around the corner. On the list are layer ration feed and a bale of hay to put in their nests. I’ll probably open the nest part of the coop sometime this week. It’s suggested to wait until the birds are 18 weeks old before giving access to nests, and that will be a week from today! How did we get from those baby fuzzballs to almost laying eggs? My babies are growing up so fast!